O God, who make this most sacred night radiant with the glory of the Lord's Resurrection, stir up in your Church a spirit of adoption, so that, renewed in body and mind, we amy render you undivided service. Through our Lord Jesus Christ, your Son, who lives and reigns with you in the unity of the Holy Spirit, one God, for ever and ever. Holy Saturday (from Sabbatum Sanctum, its official liturgical name) is sacred as the day of the Lord's rest; it has been called the "Second Sabbath" after creation. The day is and should be the most calm and quiet day of the entire Church year, a day broken by no liturgical function. 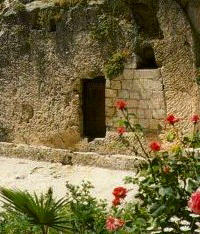 Christ lies in the grave, the Church sits near and mourns. After the great battle He is resting in peace, but upon Him we see the scars of intense suffering...The mortal wounds on His Body remain visible...Jesus' enemies are still furious, attempting to obliterate the very memory of the Lord by lies and slander. Mary and the disciples are grief-stricken, while the Church must mournfully admit that too many of her children return home from Calvary cold and hard of heart. When Mother Church reflects upon all of this, it seems as if the wounds of her dearly Beloved were again beginning to bleed. According to tradition, the entire body of the Church is represented in Mary: she is the "credentium collectio universa" (Congregation for Divine Worship, Lettera circolare sulla preparazione e celebrazione delle feste pasquali, 73). Thus, the Blessed Virgin Mary, as she waits near the Lord's tomb, as she is represented in Christian tradition, is an icon of the Virgin Church keeping vigil at the tomb of her Spouse while awaiting the celebration of his resurrection. Although we are still in mourning, there is much preparation during this day to prepare for Easter. Out of the kitchen comes the smells of Easter pastries and bread, the lamb or hams and of course, the Easter eggs. There are no liturgies celebrated this day, unless the local parish priest blesses the food baskets. In Slavic countries there is a blessing of the traditional Easter foods, prepared in baskets: eggs, ham, lamb and sausages, butter and cheeses, horseradish and salt and the Easter breads. The Easter blessings of food owe their origin to the fact that these particular foods, namely, fleshmeat and milk products, including eggs, were forbidden in the Middle Ages during the Lenten fast and abstinence. When the feast of Easter brought the rigorous fast to an end, and these foods were again allowed at table, the people showed their joy and gratitude by first taking the food to church for a blessing. Moreover, they hoped that the Church's blessing on such edibles would prove a remedy for whatever harmful effects the body might have suffered from the long period of self-denial. Today the Easter blessings of food are still held in many churches in the United States, especially in Slavic parishes. If there is no blessing for the Easter foods in the parish, the father of the family can pray the Blessing over the Easter foods. It is during the night between Holy Saturday and Easter Sunday that the Easter Vigil is celebrated. The service begins around ten o'clock, in order that the solemn vigil Mass may start at midnight. Today we remember Christ in the tomb. It is not Easter yet, so it's not time for celebration. The day is usually spent working on the final preparations for the biggest feast of the Church year. The list of suggested activities is long, but highlights are decorating Easter eggs and attending a special Easter food blessing. For families with smaller children, you could create a miniature Easter garden, with a tomb. The figure of the risen Christ will be placed in the garden on Easter morning. Another activity for families is creation of a paschal candle to use at home. The Directory on Popular Piety discusses some of the various devotions related to Easter, including the Blessing of the Family Table, Annual Blessing of Family Home, the Via Lucis and the Visit to the Mother of the Risen Christ. The Station returns again to St. John Lateran. During the afternoon of Holy Saturday the faithful were summoned here for the final scrutiny of the catechumens. Then, in the evening began the vigil or night of watching which concluded at dawn with the solemn baptisms — the neophytes, plunged into the baptismal waters and there buried with Christ, were born to the life of grace at the very time when our Savior came forth triumphant from the tomb at dawn on Easter morning.